A complete guide to achieving a fantastic spectrum of colourful glazes for the studio potter, Colour in Glazes looks at all the methods of acheiving colour in glazes, focusing on colouring oxides in detail, including the newly available rare earth oxides. Types of base glazes and the fluxes used to make them are discussed in relation to colour response. Emphasis is placed on using colouring oxides to achieve depth and variety of colour, rather than just resorting to commercial ceramic stains. The practical aspects of mixing, applying, testing and adjusting glazes are explained. and a large section of test tiles and glaze recipes is included, for use on white earthenware, stoneware and porcelain fired in electric, gas and salt kilns. 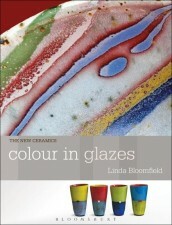 A very useful book aimed at making glazes to achieve the colour you want, and to help you broaden your palette.